527,040 minutes: How do you measure a leap year? No Photoshop doodle this year. Instead, I'm letting my creative juices flow in another way. Can you tell Mom, David, and I played Uno the other day? There's just something about 2008 that seems neat and orderly. Unlike a year with a "sloppy" seven on the end. Yes, I know I said seven was a great number, but eight rhymes with "great." Beat that! School starts back up on Monday 7 January, and we still haven't decided when during this coming weekend I'm going back down. Probably Sunday, though. My birthday is on Friday, in case you've been forgetting, so I'll be home this year to celebrate. David goes back tomorrow, as we've been reminding him throughout his break, though despite this he insisted this afternoon that he wasn't to go back until 3 January. We had a hard time convincing him otherwise, but eventually proved it to him. He's sleeping now. Of course, a big thank you to those of you who keep coming back here because you'll read what I have to say no matter what it is. Through thick and thin, I blog to preserve memories. Any subset of my memories, good or bad, would not suffice to summarize the whole thing. Alas, I can't blog everything, but I continue to do what I can because you care enough to keep me going. A thank you to those who came here through my campus celebrations video, giving me an unexpected boost on 2 and 3 December, as well as to Robert, who made my day on 17 September. Here's to a happy, healthy, and fun-filled new year! Random tangent: The first commercials aired on ABC in 2005 and 2006 were for Vytorin. In 2007, it was for Zetia, which is half of Vytorin. Apparently, we all needed to resolve to manage our cholesterol. This year, however, the first commercial was for Gardasil, which means lots of resolutions against cervical cancer. Just thought you ought to know. haha. that's kind of funny. 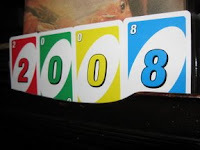 i think 2008 will be so much better than 2007, just because 8 is my favorite number, so i feel i'll be happier. plus graduate rhymes with 8, so it's like amazing? haha. good luck with the 8 am class in 2008! :-P now i'm just getting silly. you should post some of your new years resolutions. "Dec 1, 2007: Pitt beat WVU! Yeah!" Dec 29, 2007: UDayton creams Pitt! Yeah! Apples and oranges, Jay, apples and oranges. I do agree, though, that both were stunning upsets that defied all logic. In each case, one team just didn't want the win badly enough.